Pianist, composer, arranger, and recording artist, Dr. Marc Irwin uses his diverse talents as a musician within the fields of contemporary, jazz, classical, theater, and world musics. Currently residing in the Baltimore/Washington, DC area, Marc Irwin is a native New Yorker who has played for and with a variety of top performers. 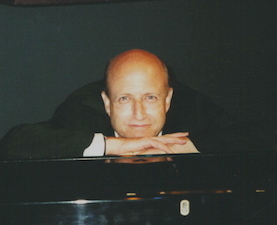 Presently, Marc Irwin is a pianist and musical director with The Capitol Steps, performing political satire throughout the 50 United States and Canada. Marc Irwin’s Broadway credits include, "Crazy For You," "City Of Angels," "Romance, Romance," "Jerome Robbins’ Broadway," "Sunday In The Park With George," "Cats," "The Mystery Of Edwin Drood," and "The Rink." Marc Irwin was a pianist and vocal coach on the production staff of Comden and Green’s "A Doll’s Life," and was Assistant Musical Director for "Mrs. Farmer’s Daughter" by Jack Eric Williams, produced by the Pepsico-Summerfare at SUNY Purchase, in Purchase, New York. Marc Irwin toured with Harry Belafonte as the sound designer and keyboardist in the United States, Europe, Asia and Africa. Marc Irwin has performed in musicals in the Baltimore/Washington, DC area at The Kennedy Center, The National Theatre, The Hippodrome, and The Lyric Opera House. Productions include "In The Heights," "Dreamgirls," "DamnYankees," "Showboat," "Cats," " Annie," and "Beauty and the Beast." Marc Irwin was assistant conductor for The Kennedy Center’s production of "Words And Music," a trilogy of musicals which included "Bells Are Ringing" with Faith Prince, "Purlie" with Stephanie Mills, and "Where's Charlie?" In 2002 Marc Irwin was assistant conductor for "Merrily We Roll Along” at The Kennedy Center as part of the Sondheim Celebration Series. That same year he conducted "The Three Mo’ Tenors" with performances at Meyerhoff Symphony Hall in Baltimore, Maryland, and at the Performing Arts Center in Newark, New Jersey. In 2010 Marc Irwin was musical director for Ray Leslee's "A Chamber Christmas Carol" at New York's Pierpont Morgan Library, starring Soprano's Uncle Junior, Dominic Chianese. Marc Irwin released two jazz CDs with guitarist Daniel Carillo, "Crossing of The Spirit" and " A Child’s Play". Marc recorded "Suite For My Father" for solo piano and two albums with Urbnergy, a jazz trio with bassist Marty Confurius and drummer Don Mulvaney: "Urbnergy" in 2007 and "Three Of A Kind" in 2011. In 2011 Marc Irwin and guitarist Barry Heimowitz formed the duo "Handmade Music" and released their self-titled album of original material. Both of these ensembles are currently performing in New York and Baltimore. From 1993 to 2000 Marc Irwin taught courses in music theory, ear training, class piano, and a studio of private students in piano and composition at Frederick Community College in Frederick, Maryland. During that time frame Marc Irwin was also an accompanist and arranger/composer for The Peabody Children Chorus, under the direction of Doreen Falby, contributing over 35 choral arrangements and compositions. At the Peabody Conservatory’s Preparatory Division he taught courses in theory and composition for commercial music as well as a studio in jazz and classical piano. From 2004-2009 he was a co-director of Jazz Ensembles at The Park School of Baltimore. He currently has a studio of private students. Marc Irwin received his Bachelor of Music (BM) with a major in Music Theory from The Manhattan School of Music. At Manhattan, he studied music theory with David Lewin, composition with Ludmilla Ulehla, and piano with Ada Kopetz-Korf. Marc received his Masters in Music Composition (MM) from The Aaron Copland School of Music at CUNY- Queens College, studying composition with Thea Musgrave. In 2000, Marc earned a Doctorate of Musical Arts (DMA) in Music Composition from the Peabody Conservatory of Johns Hopkins University, working with composer Robert Hall Lewis. He also studied modal counterpoint with composer Thomas Benjamin. While at Peabody Conservatory he was a teacher's assistant in music theory under Dr. Vern Falby. Together Drs. Vern Falby and Marc Irwin emphasized Schenkerian analysis and the work of contemporary music theorist, Edward Cone. Marc Irwin's doctoral areas of specialties include the keyboard music of J.S. Bach, the nine Beethoven Symphonies, the choral music of Arnold Schoenberg, and the compositions and improvisations of Bill Evans.